With its southern border on Long Island Sound, Narragansett Bay and the Atlantic Ocean, Connecticut is a heavily marine-oriented state with a rich history of using asbestos in shipbuilding and submarine building. Naval yards and shipping hubs drove the state’s economy, but these jobsites also posed prominent asbestos threats to their employees. Shipbuilders and sailors were at high risk for inhaling asbestos, which was a common insulator on private and U.S. Navy vessels. Workers at aircraft manufacturers, metal works and chemical plants, among other industries, in Connecticut were also at a high risk for asbestos exposure. Employees at Connecticut’s former asbestos mine faced an exceptionally high risk of exposure. Some of the state’s largest asbestos threats included the helicopter manufacturer Silkorsky Aircraft, Quinebaug cotton mill, Simpkins Industries Paper Mill and Hersey Metals Co. Hundreds of other industrial plants in Connecticut relied on asbestos as insulation for their machinery, and employees were exposed to the fibers during daily operations. Asbestos-contaminated construction materials were used in many of Connecticut’s historic buildings. Public buildings such as Berlin Town Hall and Bethel Church were constructed with asbestos-containing materials, and many private buildings and residences also contain asbestos. Many Connecticut jobs are tied to marine industries. Groton was named “The Submarine Capital of the World,” and the city’s Electric Boat Company was the U.S. Navy’s leading submarine contractor. The state was also a leading manufacturer of clipper ships in the 19th century, and Navy submarines in the 20th century. For the first three quarters of the 20th century, almost all ships were constructed with asbestos. The fibers were used as a waterproof insulator, and asbestos materials were wrapped around pipes, gaskets and other machinery in the vessel. Shipyards and the ships constructed there had many confined work spaces that contained asbestos. When workers were required to install or repair asbestos materials, high concentrations of asbestos circulated in the air. Poor ventilation in the tight work quarters caused asbestos fibers to become trapped, leading to high rates of exposure for any nearby workers. Located on 40 acres of land on the Quinebaug River, Quebec Square Historic District is home to a number of older industrial sites, including Quinebaug Mill. The mill was established in 1856 along with several minor buildings, including a waste house, a boiler house and a brick gasholder. All of the buildings were found to have asbestos-shingle roofs. Several of the residential houses for the millworkers also used asbestos siding. Located on Steel Road near Nepaug in Litchfield County, this unnamed mine was a past producer of anthophyllite asbestos. Numerous scientific studies have shown that mesothelioma, lung cancer and asbestosis can develop after exposure to anthophyllite asbestos. For example, a study reported four mesothelioma cases among 736 anthophyllite miners when only one case was expected based upon exposure conditions. Researchers noted that lung cancer among the miners increased with both extent of anthophyllite exposure and amount of cigarette smoking. Located in Granby, Connecticut, the Bradley Air National Guard squadron headquarters harbored many asbestos products. The Guard often used corrugated asbestos or asbestos-covered metal in their airplane hangars, and asbestos metal was a favored roofing material. In 2009, asbestos-containing floor mastic and caulking were removed from the 7,751-square-foot C-21 Operations Facility Building 18. Previous abatement and air sampling had been performed at the facility in 2006. The New London Naval Submarine Base on the Thames River in Groton was the world’s largest submarine base. By 1959, the base employed 8,210 active personnel. In addition to training and intelligence programs, the base also had its own conversion and repair unit, where parts that may have contained asbestos were frequently replaced or removed from submarines. In 2008, EnviroGuard Asbestos Removal Contractors performed a $398,000 asbestos abatement project on the New Haven Coast Guard buildings. Earlier, the Coast Guard Academy’s Chase Hall B Annex was found to contain asbestos tiles. The Coast Guard Museum was also closed in 2011 for asbestos abatement. Due to the Coast Guard’s extensive history of asbestos use, other areas of the Connecticut base may have been contaminated with the material. Connecticut was also home to many industrial companies where asbestos was frequently used. Chemical factories, power plants and manufacturing plants were all high-risk areas. Connecticut-based companies such as the Smurfit-Stone Container Corporation, Connecticut Yankee Atomic Power Plant and Millstone Power Plant may have exposed their employees to asbestos. Asbestos was also a common construction material. Many of the older buildings in Connecticut were built in the years when asbestos products were widely used. Like in most states, asbestos liability cases in Connecticut rarely go to a jury. Since 1989, only one mesothelioma case in the state concluded with a jury verdict. That lawsuit resulted in a $2.6 million verdict to the family of a Navy aircraft carrier firefighter who died of mesothelioma. The court later reduced the March 2009 verdict by approximately $268,000 because of past medical insurance benefits the deceased received. The jury found that the defendant, Allis-Chalmers Manufacturing Co., designed defective pumps that contained asbestos gaskets and packing. In addition, the jury decided the company failed to warn workers about the risk for asbestos exposure. The firefighter developed his fatal cancer after working on asbestos-contaminated pumps aboard USS Forrestal when the ship was stationed in Groton. In 2003, the wife of a deceased former Air National Guard veteran filed and won a wrongful death case on behalf of her husband, naming Connecticut Air National Guard as the primary defendant. The Air National Guard appealed the case in 2007, but the courts upheld their original ruling in favor of the plaintiff. In 2018, the Connecticut Supreme Court upheld a ruling from the Compensation Review Board awarding workers’ compensation benefits to the estate of Donald Filosi, Jr., who died of asbestos-related lung cancer. Filosi developed lung cancer as a result of exposure to asbestos during his employment at Electric Boat, a company that designs and builds nuclear submarines. Part of his job as a rigger involved dumping 55-gallon barrels of asbestos-containing waste from the submarines. The Asbestos Program in Connecticut makes sure that asbestos is removed properly as required by law. 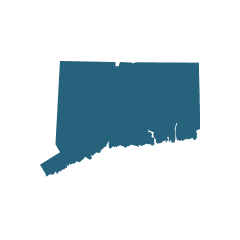 Led by the Connecticut Department of Health, the program works with the Environmental Practitioner Licensing Unit to regulate the licensing of asbestos abatement contractors and asbestos consultants. The Asbestos Program also is responsible for ensuring that asbestos-containing materials in schools are managed safely. These regulations apply to all public and private, not-for-profit schools from kindergarten to grade 12. The Connecticut Department of Health’s asbestos regulation is essentially the same as the U.S. Environmental Protection Agency’s 1986 Asbestos Hazard Emergency Response Act. The department enforces standards for asbestos abatement, including specific guidelines for removal and encapsulation procedures, follow-up air testing, recordkeeping and official notifications for upcoming building demolitions. Failure to follow Asbestos Program regulations can result in criminal charges with daily fines ranging from $50 to $25,000, depending on the severity of the violation.